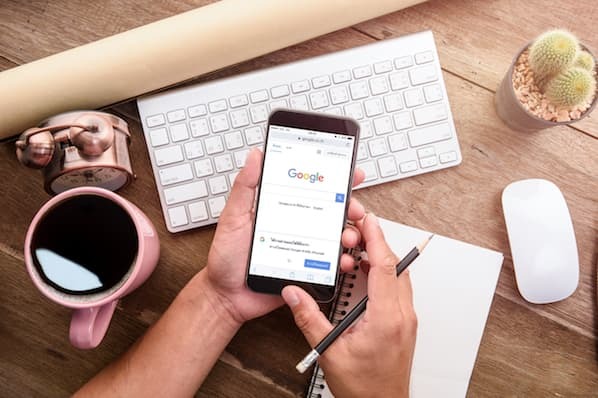 Expanded Text Ads (ETAs), announced in July of 2016, are considered by most industry observers to be the biggest change to Google Adwords in 16 years. Google’s new ETAs provide for an increase of 50 percent more ad space. Plus, ETAs pack in a few other exciting features as well. 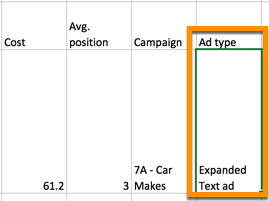 Below is a comparison between the expanded text ad format and the standard text ad format. As opposed to standard text ads, ETAs have two headlines — a main headline and a secondary headline. Each headline can use up to 30 characters, as compared to the prior format of one headline with 25 characters. When creating ETAs, the final URL has to be entered first (above the headlines) and the display URL is created automatically based on that. There are two optional path fields available to extend the display URL by up to 15 characters each. ETAs have one long description field with a maximum length of 80 characters. This compares to two fields of 35 characters each with standard text ads. Now that we’ve gone over the guts of what makes ETAs, let’s get started on some best practices in order to take full advantage of them. The main headline is the section that most people will see first and pay attention to. Put your most vital information here and make sure to include the main keyword you are targeting in the associated ad group. If you have a long keyword term, then just put your entire keyword in the main headline. The secondary headline is best for supporting information. This is where you’ll reference the main benefit or USP of your product or service, or stress the urgency of your offer. Keep in mind that your secondary headline may not always be shown in full. This is because, while you’re allowed up to 30 characters, Google determines ad display based on pixel-count. For example, wider characters such as “W” take up more space. So, if your two headlines go over the allowed number of pixels, Google may trim down your secondary headline. In most cases, your ad preview will show how your ad will look but it is a good idea to allow some breathing room. 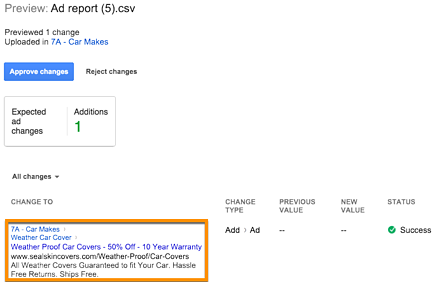 Unlike standard text ads, you can now do so much more after adding your keywords. You have some creative freedom to craft a headline that demands attention. Use language that will appeal to your target audience to convince them to interact with your ad. This combination is sure to increase your click-through rates considerably. Below is an example of an expanded text ad that has been very successful. It blends in keywords (DDoS Protection and Stop DDoS) very well with urgency and value-add. Here is another example of a compelling ETA. It combines keywords (User Behavior Analytics) effectively with an attractive offer (Free Guide) and the target audience (CISO). After grabbing attention with your headline, use the description to provide supplementary information to convince searchers to click through to your page. The best way to utilize this section is to include an additional benefit, a feature, and a call-to-action (CTA) or offer. A CTA such as “Start Free Trial,” “Shop Now” or “Download Free Guide” will let users know exactly what to expect on your landing page and will boost conversions. Remember, the description is the final attempt to get a searcher to click-through to your site instead of others—so use your extra description space wisely. Be sure to differentiate your product or service from the competition and make sure that users know why your brand is their best option. The two new display URL path fields are optional, but you will almost always want to use these. They are excellent places for adding your keywords. If you have a long keyword, you can break it up and use both path fields for your keyword. 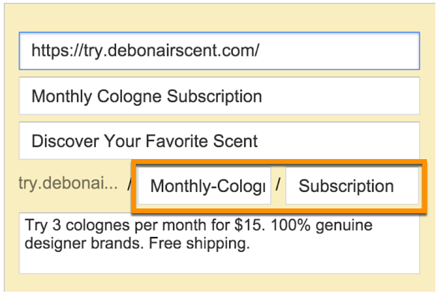 Otherwise use one field for the keyword and use the other for a call-to-action, especially if you were not able to do this in the description field. If you are creating an ad for a keyword containing a competitor name or a trademarked term, you are not allowed to use this keyword in the headlines or the description. But Google does allow you to use such a keyword in the URL path fields. This is the only way that you can get a competitor or trademarked term in your ad copy. Given that a large chunk of your audience will be using mobile devices to view your ads, you need to make sure that your ad works well on mobile. With standard text ads, Adwords allowed you to create separate mobile ads. 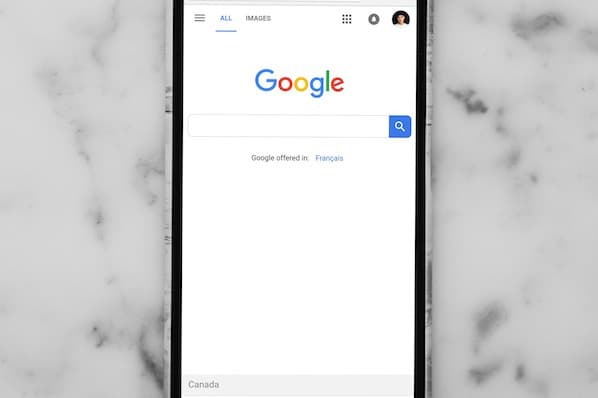 However, ETAs don’t differentiate between devices, which means that the same ad and the same copy will be displayed to searchers across all devices. ETAs viewed from a mobile device may have headlines broken up into two lines if they’re too long. Because of this, it is important to format your ads in a way that will work effectively both on desktop and mobile devices. The mobile preview feature in the ad editor will show you how your mobile ad will likely look and you can adjust your copy based on that. While ETAs may show up for all the keywords in your ad group, they won’t necessarily attract more clicks than your standard text ads. In fact, it’s possible that you may even see a decline in your click through rate (CTR). Instead of dropping your old ads right away, try adding ETAs to the same ad groups with old ads that have served you well in the past. Compare the performance of the two, and alter and evolve your ETAs until they match or surpass your standard text ads. In most of our tests though, the expanded text ads have performed significantly better than standard ads. Below are some A/B tests that we have run. A/B Test 1: The 2 ETAs below had a combined CTR of 10.9% - an improvement of 26% over the already excellent 8.62% CTR of the old standard text ad during the same timeframe. A/B Test 2: The ETA below had a CTR of 5.49% - an improvement of 54% over the standard text ad. A/B Test 3: The ETA below had a CTR of 3.36% - an improvement of 167% over the standard text ad. Having a good quality score for your keywords and ads is an absolute must for success with AdWords. In order to achieve high quality scores, you have to ensure that your ads are as relevant as possible to user search queries. It is also important to achieve a high click through rate for your ads, as this provides a direct signal to Google that users are finding your ad useful. There are a few key things to take into account when creating ETAs which will help your quality score. You should always include keywords in your headline as well as the display URL path fields. If you are bidding on a competitor name or trademarked term, and do not use it anywhere in your ad copy, you will get a very low quality score. So it is crucial to add these in the path fields of the display URL as we noted in the last section. You should also use as many ad extensions as possible with your ads. When combined with ETAs, this greatly increases the amount of screen space that you can claim with your ad, leading to high CTRs and high quality scores. Use ad extensions to further elaborate on the features, benefits, attributes and offers related to your products and services. Since you likely had to shorten these in your main ad, you can use extensions to fill in the gaps. Also add reviews, ratings, location and call information if you have these available, and they are relevant for your business. For example, consider the ad below that combines an ETA with call, callout, review, and sitelinks (with 2 line descriptions) ad extensions. That’s a significant chunk of Google’s search results page! If you have a lot of standard text ads in your account, changing them all over to expanded text ads may seem a bit daunting. 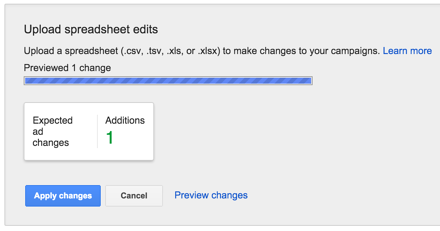 You can make your job a little easier by adding new ads in bulk. 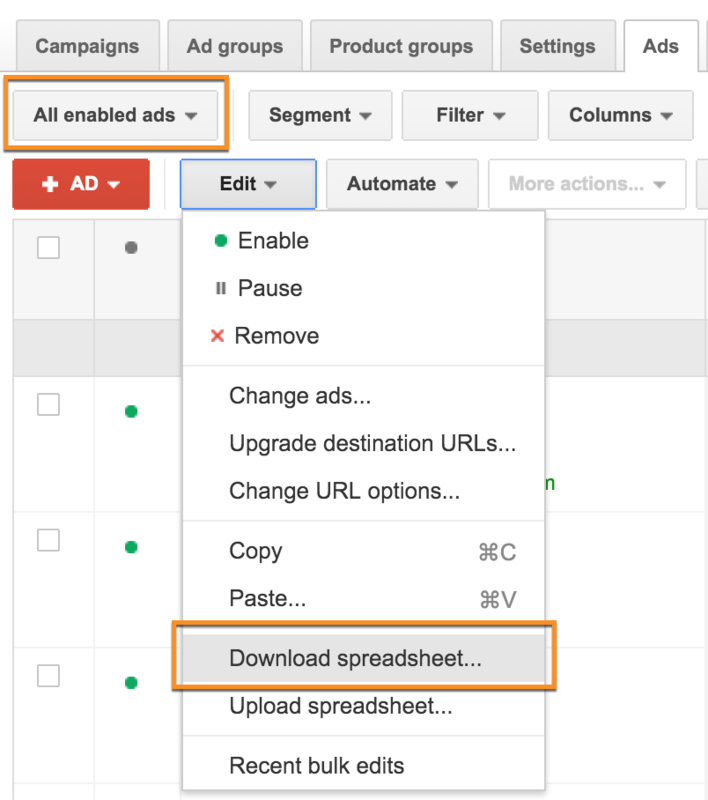 You can download your current ads to a CSV file, make all your changes, and then upload them back to your Adwords account. Using this approach will add new expanded text ads in the same ad groups and campaigns as your current ads. It will not remove any of your current ads. Here’s how you do it. Step 5: Click “Advanced editing” and uncheck all boxes except “All Editable Columns”. Then click Download and save the file on your machine. 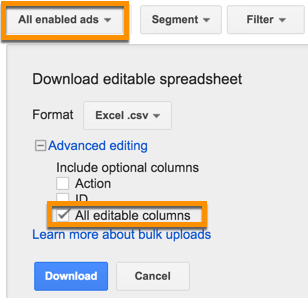 Step 2: For each ad that you want to create an expanded text ad for, add values in the Headline 1, Headline 2, Description, Path 1 and Path 2 columns. You can use values in the Ad, Description line 1 and Description line 2 columns (in the same row) as a guide since these represent your current ad. Step 3: Delete the Ad, Description line 1, Description line 2 and Display URL values from the same row. Step 5: Repeat steps 2, 3 and 4 for each expanded text ad you want to create. NOTE: If you are new to this process, it will be best if you try and add only one expanded text ad the first time. In this case, you should just delete all rows other than the row you just edited. 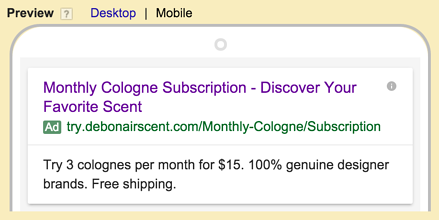 Step 4: Google will now show you the number of ads that will be added. This should be the no. of new expanded text ads that you added in step 2 of the Make Changes section above. If there are any problems with the data you added, it will be shown in this box. Step 5: Click on Preview changes. Even if you had any errors in step 4 above, you should do this to determine exactly where the problems are. Step 7: If everything looks good, click Approve changes to add your new ads. If you see any problems here, click Reject changes. Go back to your CSV file in Excel, fix the problems and then try again. Now that you’ve got a better grasp on expanded text ads and how to use them, you can get started on your own ads. Remember, you don’t want to pause your standard ads just yet—these new processes are going to take a bit of practice before you become an expert. The clock is quickly running out; Google’s last day of standard text ad support is January 31, at which time we’ll all be forced to adopt the new expanded text ad format. Rather than scrambling at the last minute, it’s best to get started now. Work out the kinks and find out the best ad copy that works for you.